Liu Yuhong's family had a quarrel with their landlord. Now her parents are in a re-education camp and she miscarried after being beaten in a ''black jail'', writes John Garnaut in Beijing. 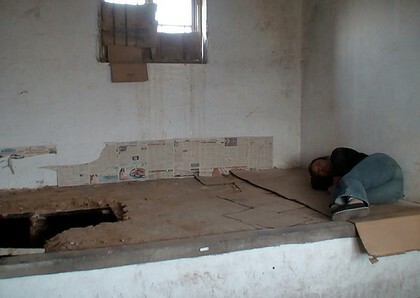 Liu Yuhong's problem began as a private land dispute with the family's landlord. But small troubles have a habit of escalating in China, a country that lacks institutions for effectively resolving disputes. Last year Liu's parents lodged a complaint at the local government's petitions office. Since that brave and perhaps foolhardy move, the family has been drawn into a vortex of state-sanctioned kidnapping, violence and possibly worse. ''My father is 69 years old and he is in a re-education-through-labour camp,'' she told the Herald on Wednesday. In the absence of an effective legal system, citizens are officially encouraged to take their grievances - everything from high-level corruption to land disputes - to a unique Chinese institution: the petitions office. These were established in imperial times and have since been replicated at almost every tier of government. The design flaw of the petitions system is a fundamental one: the offices are typically run by the same officials that the petitioners are complaining about. When ''petitioners'', as they are called, don't get results at the local level they tend to aim higher, in Beijing. Yu Jianrong, a scholar at the Chinese Academy of Social Sciences, surveyed 632 Beijing petitioners and found only one case that had been satisfactorily resolved. Professor Yu has warned that officials had incentives to subvert the petitions system because complaints relating to their jurisdictions count directly against their performance appraisals. He says the petitions system is strained to breaking point because the party refuses to loosen its grip on the political and legal systems, thus choking off alternative ways for disputes to be debated or independently adjudicated. The Communist Party ignored his advice, choosing instead to reassert its primacy over the country's media and courts. And so China's enormous security and legal apparatus devotes ever-increasing resources to preventing complaints from being officially registered or publicly aired, rather than resolving them. Six years ago a high-profile death in custody led the central government to abolish the lawful detention centres that were used to contain vagrants and petitioners. This didn't end the persecution of petitioners; instead it drove it underground, into so-called ''black jails''. Human Rights Watch this week released the results of its survey of 38 people - all petitioners - who had been illegally detained in these jails. ''Faced with financial incentives to keep petitioners out of sight in Beijing, but no longer armed with a legal means for doing so, provincial and municipal-level officials have developed an extrajudicial system to intercept, abduct, and detain petitioners in black jails,'' says the report, Alleyways in Hell. The predictable result is an endless tide of personal catastrophes, such as the case of Liu Yuhong. Liu's parents grow poplar trees for timber on a small tract of land they rent from a farmer in Liyuan county in Tangshan, China's steel-producing heartland. Their dispute arose when the landlord permitted a builder to cut down several trees and they received no compensation. The county petitions office agreed with their claim but did not enforce its verdict. Liu's parents wanted to lodge their complaint next with the State Council's petitions office in Beijing, but were prevented from doing so. So they took their documents directly to Tiananmen Square, where they, like so many others, could display them to the passers-by - a symbolic act of exasperation. Liu's mother, Liu Fengqin, has attempted to take her satchel of documents to Tiananmen Square on 35 occasions since September last year. She was detained each time. Liu has also been detained several times and has become an expert on the system. She describes a network of unofficial ''interceptors'' who are paid by various local governments to intercept petitioners before they make it to the Beijing petitions offices or Tiananmen Square. ''Some petitioners get caught as soon as they get off the bus on Chang'An Avenue, before they even know what's happening,'' Liu says. More frequently, petitioners are intercepted by Beijing municipal police on or around Tiananmen Square. Police have become experts in spotting petitioners among the throngs of sightseers by listening for distinctive rural accents and watching the way they move, the clothes they wear and the bags of petition documents they invariably carry. Petitioners are escorted to Tiananmen East police station, where an electronic welcome sign says ''Law Enforcement for the People''. Every couple of hours a busload of petitioners is taken to Majialou, in Beijing's south. Liu has been on that bus five times. She took us there. Majialou is a former police station that was shut down, reopened and now rebadged as a city government ''Welfare Relief Centre''. In the basement, she says, there are about 30 large rooms, each with the name of a province above the door. Liu was taken to the Hebei province room and then ''retrieved'' by Hebei officials and their casually hired assistants. The young guard at the Majialou front gate asked if we were ''retrievers''. The going rate for retrievers is about 150 yuan, they said, although it varies between regions. Tangshan city retrievers take their local petitioners to the Kailuan Hotel. ''It's just an ordinary hotel, except taken up entirely by Tangshan petition officials,'' says Liu. Tangshan petitioners are grouped in the hotel lobby and taken ''home'' to their local county detention centres. At this point, there has been no paperwork and no legal justification for the petitioners' abduction, detention and expulsion from Beijing. ''Recidivists'' are then sometimes sent to re-education labour camps. Liu and her parents have worked in brick kilns and outsourced factory units, helping local companies manufacture light bulbs, cotton buds and cardboard boxes - sometimes to meet urgent customer orders. Often there are valid arrest papers, but sometimes there are not. In July, Liu's parents were both sentenced to a year's re-education through labour. On September 26 Liu was again in Beijing, this time seeking advice from a lawyer about her parents. She usually stays in one of Beijing's many ''underground'' hotels, which are invariably filthy but relatively safe. ''They don't report you to police and they are literally underground, so police have trouble tracking the signals from our SIM cards,'' Liu says. But late September was an especially sensitive time for Beijing's petitioner-busting police. The central government had given edicts to prevent petitioners from arriving in the city and disturbing the ambience of the October 1 National Day military parade - this year coinciding with the 60th anniversary of the founding of the People's Republic. Patrols were taking place across Beijing and all of Liu's usual underground hotels had been shut down. She took the risk of registering at a regular hotel, far from the city's petitioning precinct. Police knocked on her door at midnight. They searched her phone and found a text message from a local journalist, received on September 1. It said: ''Why did your mother kneel down [petition] so many times in Tiananmen Square? I need detailed information.'' That was evidence enough for the police to justify detaining Liu again. This time, Liu was given special treatment to match the importance of the national celebration. At 2am on September 27 she was driven to Xinggezhuang guesthouse and handed over to four young lads without uniforms, who drove her away to a new destination. She was then driven in a county government car to a lone row of dirty, bare-concrete cells near Tuhe reservoir. ''I couldn't fall sleep at night because of several days without food and the cold,'' she says. Liu was still in her black jail cell on the morning of October 1, when President Hu Jintao stood in front of an immaculately presented Tiananmen Square to applaud China's glorious 60 years. ''The Chinese people have stood up,'' he told the world. About that time, Liu says, her plain-clothes guards bound her to a stretcher bed and a county family-planning doctor forcibly tried to insert an intravenous drip. By now she had gone five days with little food or water and the doctor left when he couldn't find a vein. She says her guards then tried to pour the liquid down her nose and mouth. She says she was made to vomit and the walls were splattered with her blood, as they beat her face. She was released and later detained again. On October 19, in another detention cell, she miscarried what would have been her third child. Liu has photos that appear to corroborate her black jail ordeal. She obtained them by bribing the young guards who had been keeping her. On October 5 she received a phone call from a senior county police officer. ''He told my mother had died of a heart attack,'' she says. The police chief acknowledged that people aged over 60 are not supposed to be held in labour camps but said the Liu family case was special. And he also delivered the first good news that Liu can remember: ''Liu Yuhong's mother is not dead. ''She is now in Hebei Woman's Re-education Through Labour Centre.'' By this time, the Herald photographer, who was returning from meeting Liu at her now-abandoned black jail in Tangshan, was being tailed. We called Liu at her home. ''My house is surrounded by two dozen officials,'' she said. But she had already got her story out and did not seem the slightest bit concerned.